Our chopped ham starts as the finest blend of ham chunks, trimmings and seasonings. 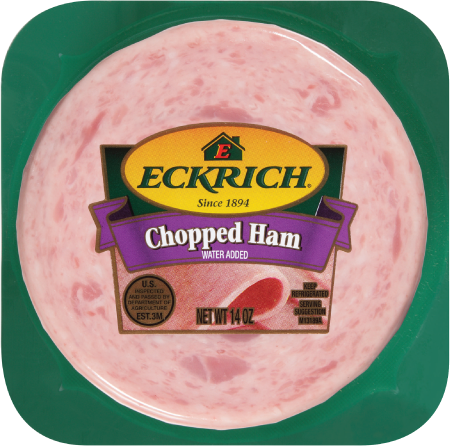 It’s got the great traditional texture and flavor you love in a classic chopped or “chipped ham.” Eckrich lunchmeat has no by-products or artificial colors or flavors. We’re also proud that our chopped ham is soy free and gluten free. Bite into a nostalgic chopped ham sandwich today. Ingredients: HAM, WATER, SALT, CONTAINS 2% OR LESS OF DEXTROSE, POTASSIUM LACTATE, SODIUM DIACETATE, SODIUM LACTATE, SODIUM NITRITE, SODIUM PHOSPHATE.